Fortunately, Fortinet's midrange FortiGate appliances deliver 5 times the next generation performance of alternate products to enable mid size organizations to add new, top-rated security technologies yet still consolidate security devices. Specifically, this breakthrough performance allows most organization to combine stateful firewall with intrusion prevention and application control, plus have room to add Web Filtering and Antimalware all on one device. As a result, you get increased security beyond the traditional stateful firewall and web filter while removing one or more web proxies from your environment. Further, rich dashboards and reporting deliver the visibility and control you expect from a next generation firewall. Other security technologies cannot protect against today's wide range of content- and connection-based threats well because they rely on general-purpose CPUs, causing a dangerous performance gap. 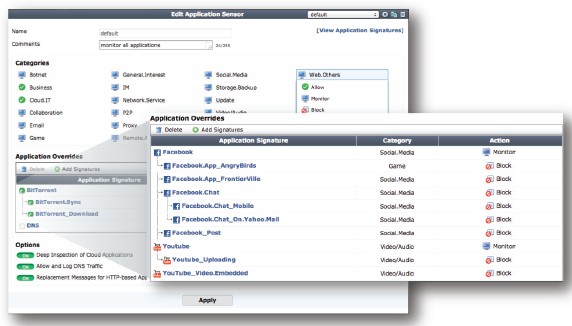 Today's branch office security gateway is no longer just a basic firewall and site-to-site VPN gateway. With the prevalent adoption of cloud based applications - both public and private, there are more associated requirements for both access availability and security. A security gateway will need robust network and high availability capabilities that include intelligent WAN link forwarding and flexible network deployment options. From the security perspective, a branch office firewall should provide abilities to identify users, locations, devices and applications; thereby control access with finer granularity and visibility. 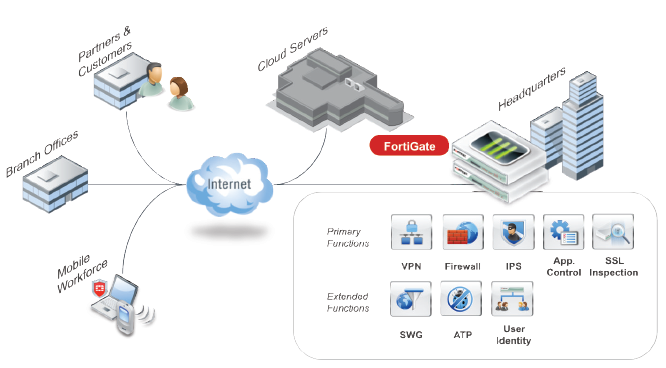 With Fortinet solution for enterprises, branch offices can enjoy significant protection with centralized facilities such as File Analysis using the FortiSandbox and FortiAuthenticator for user access management. Fortinet's Midrange firewalls are perfect for growing mid enterprises with their agile and high performance network security capabilities. The FortiGate 300D and 500D not only deliver protection exceeding expectations, they are suitable for consolidating other security components. This allows organizations to significantly reduce TCOs and simplifies the network. Unlike other NGFWs (Next Generation Firewalls), the FortiGates are powered by FortiASICs which provide security without compromises performance. They run on the World's most advanced Security operating systems that meet each organizations unique requirements. Advanced features such as integrated endpoint control and token server helps organizations to rapidly deploy enhanced security to their mobile workforce while device based policies aid to implement BYOD securely. To tackle security for today's prevalent use of personal devices, FortiOS offers state-of the art device identification capabilities that empower organization to set up more intelligent security policies. Recognizing that despite all of the latest security controls, targeted threats may still slip through, organizations have the opportunity to add an additional layer of inspection, focused on advanced threat detection in complement to established threat prevention. Often referred to as "sandboxing" or breach detection, Fortinet offers on-premise and cloud-based options to extend your next generation firewall.